For most of the last 70 years or so, treating cancer meant one of three things: surgery, radiation, or chemotherapy. In most cases, some combination of these remains the standard of care. But cancer research does not stand still. More recent developments have included a focus on immunotherapy: using, modifying, or augmenting the patient’s natural immune system to combat cancer. Last week, we pushed the boundaries of this approach forward at the 5th annual Integrated Mathematical Oncology Workshop. Divided into four teams of around 15 people each — mathematicians, biologists, and clinicians — we competed for a $50k start-up grant. This was my 3rd time participating, and this year — under the leadership of Arturo Araujo, Marco Davila, and Sungjune Kim — we worked on chimeric antigen receptor T-cell therapy for acute lymphoblastic leukemia. CARs for ALL. Team Red busy at work in the collaboratorium. Photo by team leader Arturo Araujo. In this post I will describe the basics of acute lymphoblastic leukemia, CAR T-cell therapy, and one of its main side-effects: cytokine release syndrome. I will also provide a brief sketch of a machine learning approach to and justification for modeling the immune response during therapy. However, the mathematical details will come in future posts. This will serve as a gentle introduction. Acute lymphoblastic leukemia (ALL) is a blood cancer with a very prominent role in the history of cancer research and treatment. This leukemia is tightly coupled to the immune system because it affects the cells that form the building blocks of a healthy immune response. Typically ALL affects the lymphoblast that go on to differentiate into your immune system’s B-cells and T-cells. Although for this post I will focus on the B-lymphoblastic ALL that affects only the B-lymphocytes. In the early 1940s, ALL was a death sentence and the common medical wisdom was to let children with leukemia die in peace. Sidney Faber did not accept this wisdom and in 1948 — in the face of incredulity and ridicule from other physicians — developed the first chemotherapy to induce a brief cancer remission in the children under his care. Since then chemotherapy has remained the initial treatment of choice for ALL and has improved over the years to produce long lasting remissions — the absence of detectable cancer cells in the body — and greatly increased the rate of survival. Most of the increase in survival has come from a drastic decrease in relapse, and very little improvement has been seen over the last 20 years in children who do relapse (Bhojwani & Pui, 2013). Given that liquid tumours are (often) easier to understand than their solid counterparts, leukemias have also become a proving ground for new systemic therapies. The current generation of researchers have continued channeling Faber’s innovative spirit and searching for improved treatments. CAR T-cell therapy is the latest of these developments and it is aimed at dealing with chemo-resistant ALL after relapse in both children and adults. Under normal circumstances, Nature doesn’t want an individual’s immune system attacking itself. Because of this, the T-cells of a patient do not detect their B-cell cousins as potential targets even when those B-cells are cancerous. The T-cells cannot naturally acquire the correct specificity. Thus, we have to artificially modify endogenous T-cells to have a receptor for a target that is specific to B-cells. This target is CD19 and is expressed on both normal and cancerous B-cells. The doctor takes a population of the patient’s endogenous T-cells and grafts onto them an engineered chimeric antigen receptor for CD19 — a technology that was developed around the same time as I was (Gross, Waks, & Eshhar, 1989), but only entered clinical trials recently. The resulting CAR T-cells are then infused back into the patient and proceed to attack his B-cells. Since the vast majority of the B-cells are cancerous and B-cell aplasia can be managed, the CAR T-cells act to reduce the tumour burden and heal the patient. This is wildly effective in the case of ALL and the early phase-1 trials have shown a greater than 80% response rate to the therapy (for a review, see Maude, et al., 2015). A big advantage that our team had this year was that one of our physicians, Marco Davila, was the lead scientist on one these early trials: the 2014 clinical trial of CAR T-cell therapy for ALL at the Memorial Sloan Kettering Cancer Center (Davila, et al., 2014). He has intimate knowledge of the disease and its treatment, and access to the detailed dataset from the study. Given the high efficacy of these early trials, there is little that can be done to improve the probability of remission. Although it is always possible to work on predicting and extending the length of the remission. Instead, the current bottleneck for the treatment is the high toxicity related to cytokine release syndrome (CRS). Cytokines are signaling proteins, used — among other things — by immune cells to influence the behavior of other immune cells. When these are caught in a positive feedback loop, they allow the immune system to produce inflammation and fever to respond to an antigen. However, if this loop is not properly regulated, it can lead to the cytokine storm of severe CRS. This manifests for the CAR T-cell therapy patients as a multi-day persistent high fever, extremely low blood pressure, low oxygenation of the blood, and sometimes neurologic disorders such a severely decreased level of consciousness — the patient can become obtunded: increases sleepiness and a decreased interest in their surrounding with slowed responses on the level incoherent mumbles or disorganized movements — or seizures. Post chemotherapy ALL patients — which is all the patients in these trials — have the weakest immune systems possible and these cytokine storms are expected to be worse for people with stronger immune systems. Thus, CRS is expected to be an even bigger barrier in efforts to translate this therapy for patients with healthier immune systems suffering from other cancers. For me, it makes sense to focus our efforts on understanding this toxicity and side-effect of therapy, especially since they are directly informative of and caused by the central player in our drama — the immune system — and how to limit the adverse effects without compromising the efficacy of the therapy. 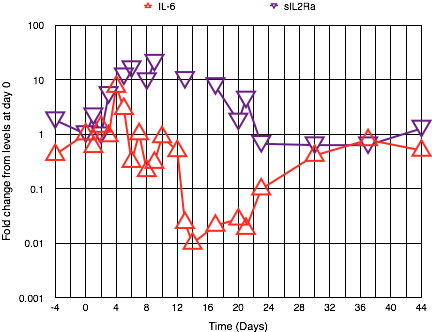 Fold change in IL-6 (red) and sIL2Ra (purple) levels from day of CAR T-cell infusion (day 0) versus time for a single patient from Davila et al. (2014). This patient received steroids from day 6 as a response to severe cytokine release syndrome. The most common approach for mathematical modeling of the interaction of the immune system and tumours is to lump all the cytokine activity — and many others things — into a single immune response term. Or, as Marco called it during one of our chalk-board discussions with him, a “fudge factor”. Instead of this lumping, I was drawn in by the rich dataset that the clinical trials collected. Davila et al. (2014) ran on each of the patients’ daily blood samples a cytokine array that measured 29 different cytokine markers along with circulating tumor volume and qPCR for estimating the number of CAR T-cells. At the right you can see an example of this data. The figure shows the levels of two cytokines IL-2 (via the proxy sIL2Ra, in purple) and IL-6 (in red) for a single patient from the MSKCC clinical trial. Since each cytokine behaves in slightly different ways, I thought it would be best to structure a model with population compartments that corresponded primarily to these observables, or at least a few of the more important ones. I will describe the details of such a system of ODEs in an upcoming post. This is the first novel aspect: focusing on the toxicity and decomposing the cytokine activity into separately modeled parts instead of a single immune response term. The second novelty is in the approach to parametrization. The typical work in oncology is an insilication: the modeler uses her physical or biological intuition to guess the causal mechanism by which certain cells interact and then sets the parameters of those interactions (in the ideal case) from reductionist experiments that try to isolate that mechanism in the lab or (in a more typical case) from educated guesses. This can be a great approach for areas where (mathematical) theory and experiment are kept close, but — given the current status of mathematics in medicine — I personally don’t feel comfortable using such insilications in clinical settings with actual patients. Instead, I prefer a personalized and less intuition-dependent approach via abductions. A machine learning approach. For these sort of abductions, we guess a general structure for interactions that doesn’t necessarily have a reductionist justification and might be mostly based on hints from phenomenological observations. Phenomenological observations that are often made are at the description level of the whole patient and thus clinically more reliable and more comfortable for doctors. We then simplify the resulting abstract model to have as few interactions and non-observable compartments as possible. To get the parameters of these interactions we fit the whole model to some fraction of each individual patient’s time series and cross-validate on the other part of the time series. This leads to less understanding that can be transferred to reductionist experiments, but (if the cross-validation is successful) allows me to have confidence in a model that accounts for the differing phenomenology of each patient. Of course, my take on this machine learning approach is extremely optimistic. In the end, it might be wrong-headed in its railing against the accepted modeling wisdom. However, this is a question that can be reserved empirically. In the coming weeks, I plan to work more closely with Marco to figure out if models that are simple enough to be fit are flexible enough to capture the essential features of CRS during therapy. The hope is that in the process I will develop a pipeline that we can use for other modeling tasks where we have a rich source of quantitative time series data for individual patients. And maybe even aim to provide doctors with real-time feedback on the (projected) effectiveness and toxicity of their treatment. In previous years I blogged about our team’s look at the risk of relapse in CML (2013) and H. Pylori in the gastric crypt (2014), and Jill Gallaher wrote about her team’s work on cancer, the immune system, and the microbiome (2014). Check out these posts if you want to learn more about the IMO Workshop. This article will share much in common with my previous thoughts on CML. It is not even clear to what extent clinicians are aiming to make CAR T-cell therapy remissions permanent. It would be great if it could cure the leukemia, but it also seems satisfactory to give a window of remission during which the patient can be prepared for a more established treatment like a bone-marrow transplant. Another ubiquitous side-effect that caught my attention early on is (delayed) tumor lysis syndrome (TLS). This is caused by the kidneys not being able to keep up with the levels of toxins released during cell apoptosis. It is relatively easy to track in the blood work, and serves as a good proxy for the amount of cell-death in the system. But since TLS is not a limiting factor to therapy, I will not focus on it in this post. Severe CRS is extremely dangerous, and similar cytokine storms are believed to be responsible for many of the 50-100 million deaths during the Spanish Flu. A notable aspect of this pandemic is that unlike other flus that are most dangerous for the very young and very old, the Spanish Flu disproportionally killed young adults with healthy immune systems. In this case, the healthy immune system was more liability than asset (Osterholm, 2005). Although this is not the complete story. For example, patients with chronic lymphoblastic leukemia (CLL) are also immunocompromised but to a much lower extent than those with ALL. CAR T-cell therapy was introduced to this cohort earlier than for ALL, but it has been less effective at producing clinical responses with the rates of remission being closer to 30 to 45% in CLL compared to the 80%+ in ALL. Given the CLL patient’s more intact immune systems, you might expect this to be due to dosing restrictions imposed by CRS, but CRS is less common in CLL patients even with higher tumor burdens than their ALL peers. It also isn’t due to lesser persistence of CAR T-cells, as you might expect with the healthier immune systems’ cells out-competing the engineered T-cells, given that Brown, Porter & O’Brien (2014) mention that the CAR T-cells persist longer in CLL that respond to therapy than in some ALL patients. As such, much like the case with CML, I would expect that the rate of response might play a big factor in therapy effectiveness. This modeling of the immune response as a single term is the safer approach that our group went with during competition, but it isn’t the approach that I want to share here. Maybe later another group member will want to blog about the actual model we presented at the IMO Workshop. Marco tells me that when the patients are under their most intense monitoring he might be drawing blood samples up to three times a day. This would give us a very rich time series. For future patients, the analysis of these samples could also include more sophisticated techniques like flow cytometry instead of (or, in addition to) qPCR. This is an aspect that my group ended up focusing on during the competition because they were interested in carefully modeling the phenotypical variance and associated quality of the CAR T-cells. This made the approach limited to future studies, while the proposal I sketch here is meant to be tested with existing datasets before requiring data-collecting commitments from future clinical studies. It is also important to note that a lot of these analyses are not real-time. Although the blood is drawn frequently, even in future studies it cannot be used to instantly affect the model. Many of the blood tests can take several days to run. Thus, if the approach proves useful on existing datasets and a real-time model for use in the clinical is required then it would be important to evaluate how the model would perform with access only to tests that can be done instantly. Thankfully, a lot of this follow-up evaluation could be done in simulation of the validated model. In my original approach to this modeling via abduction technique, these structural aspects would be guided by intuition and extraction of a mathematical model from the mental models of clinicians and cancer biologists. As such, they can face some of the same criticism that I raise against insilications. However, during their presentation, the winning blue team presented a more systematic approach developed by Dan Nichol and Alexander Fletcher (inspired by Davidich & Bornholdt, 2008) for finding all possible structures that satisfy some global phenomenological constraints. I think this can be adapted to allow folds over possible structure in the machine learning approach sketched here. This might allow us to reason more rigorously about the statistical properties of the approach. Hopefully I will be able to convince Dan to contribute a blog post outlining the work he did during the workshop. It is important to note that not all mechanistic aspects are eliminated; this is not just statistics. By optimizing over a hypotheses class that consists of systems of ODEs, we can then open up these ODEs and study their rates to see how to relate them to the more traditional existing heuristics and insilications. In that context, this technique would become a means to do complex measurements to inform more sophisticated models. Bhojwani, D., & Pui, C. H. (2013). Relapsed childhood acute lymphoblastic leukaemia. The Lancet Oncology, 14(6): e205-e217. Brown, J. R., Porter, D. L., & O’Brien, S. M. (2014). Novel treatments for chronic lymphocytic leukemia and moving forward. In American Society of Clinical Oncology Educational Book 34:e317-e325. Davidich, M., & Bornholdt, S. (2008). The transition from differential equations to Boolean networks: a case study in simplifying a regulatory network model. Journal of Theoretical Biology, 255(3): 269-277. Davila, M. L., Riviere, I., Wang, X., Bartido, S., Park, J., Curran, K., … & Brentjens, R. (2014). Efficacy and toxicity management of 19-28z CAR T cell therapy in B cell acute lymphoblastic leukemia. Science Translational Medicine, 6(224): 224ra25-224ra25. Farber, S., Diamond, L. K., Mercer, R. D., Sylvester Jr, R. F., & Wolff, J. A. (1948). Temporary remissions in acute leukemia in children produced by folic acid antagonist, 4-aminopteroyl-glutamic acid (aminopterin). New England Journal of Medicine, 238(23): 787-793. Gross, G., Waks, T., & Eshhar, Z. (1989). Expression of immunoglobulin-T-cell receptor chimeric molecules as functional receptors with antibody-type specificity. Proceedings of the National Academy of Sciences, 86(24): 10024-10028. Osterholm, M. T. (2005). Preparing for the next pandemic. New England Journal of Medicine, 352(18): 1839-1842. Hey Artem, that is a quite remarkable article. I am researching cytokine storms, in silico. I was wondering if the data series from the aforementioned trial is publicly available. Hi Murat, I am glad you enjoyed the article! Unfortunately, I don’t think that data is public, I could only play with it a bit because I was at Moffitt. Sorry that I couldn’t be more help. Thanks for the quick reply. Do you know of any simulation software specific to cytokine storms, or t-cell activation? I found a java code from University of New Mexico, a presentation of HPC simulation from University of Vienna, and a tool called GRO from Washington university. However none of them seems to be right tool for the job. I would just start with an ODE compartment-based model from scratch and switch to more heavyweight things if that fails spectacularly.